Several major hotel companies have come out with new brands in recent years that target the growing market of millennials and their high-tech, social media lifestyles, like Starwood’s Aloft, Marriott’s AC Hotels, InterContinental Hotels Group’s EVEN Hotels and Best Western’s Vib. And now Hilton is doing the same with a new brand called Tru by Hilton. The Tru properties will all include guest rooms with all-white platform beds, 55-inch TVs, eight-foot-wide windows, lots of power outlets and spacious bathrooms, Hilton said. 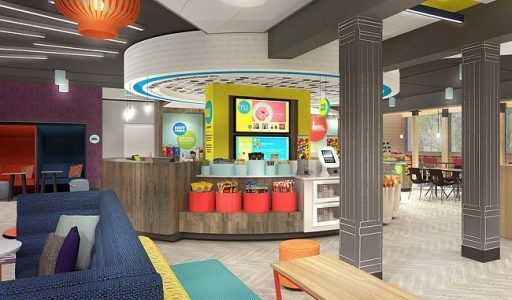 The lobby area (designated “The Hive”) will have four zones, for “lounging, working, eating or playing.” (The Play Zone will offer table games and a big TV with DIRECTV service and tiered seating.) The Command Center (read: front desk area) serves up a “social media wall with real-time content to foster engagement among guests” and a 24/7 market with snacks, single-serving wine and beer, and “healthy light meal options.” The company says it already has signed contracts for 102 new Tru hotels, with 30 more in the approval pipeline. Locations mentioned include Atlanta, Dallas, Chicago, Houston, Denver, Nashville and Portland. (Travel Skills Daily). Note: Chris McGinnis at Travel Skills also reviewed the similarly-themed EVEN hotel in NYC, and you can read that review by clicking here.